(by Marisa Schultz, New York Post) – President Trump issued a new travel ban Sunday evening to restrict visitors and immigrants from eight countries that have inadequate vetting procedures. 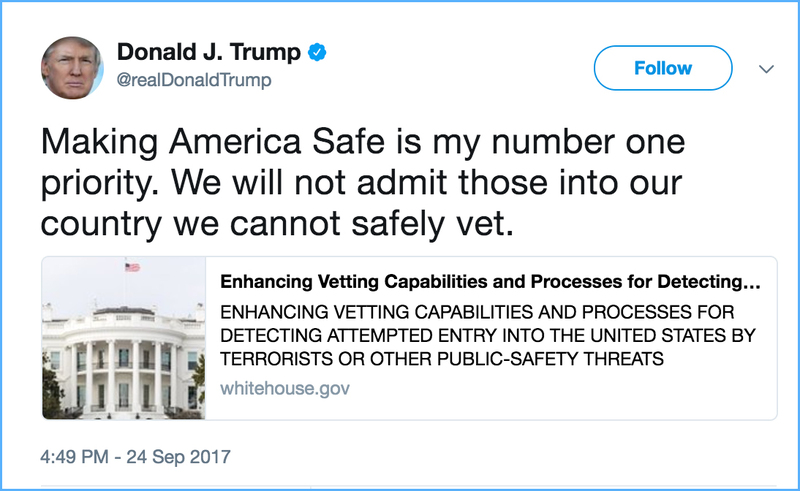 “Making America Safe is my number one priority. We will not admit those into our country we cannot safely vet,” Trump tweeted Sunday in announcing immigration policy. Trump’s March 6 executive order that covered travelers from six countries — Iran, Libya, Somalia, Syria, Sudan and Yemen — ​expired Sunday evening. 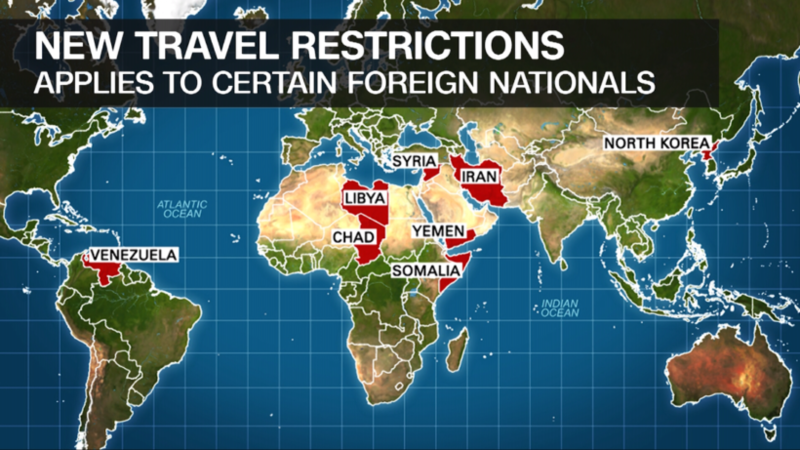 The new proclamation will maintain travel restrictions on Iran, Libya, Somalia, Syria and Yemen. Sudan has been dropped from the list. 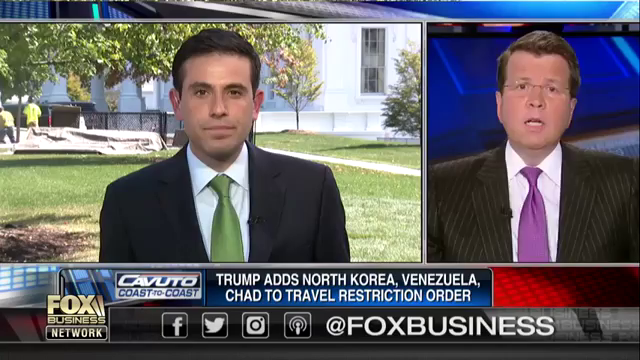 But traveling from three new countries will now be suspended and limited: Chad, North Korea and Venezuela. “These restrictions are both vital to national security and conditions based,” a senior Administration official said Sunday. The travel restrictions on the new countries will kick in at 12:01 am on Oct. 18. Guidelines will be sent to embassies and consulates on how to implement the new proclamation. The Supreme Court had already decided under the previous travel ban people with a “bonafide” relationship to the United States would still be welcomed and such waivers are expected to remain in place. Anyone with a valid visa currently will not have their travel documents revoked, senior Administration officials told reporters Sunday. This year, the Trump Administration conducted a worldwide review of countries’ immigration and travel procedures to ensure national security. The Administration concluded seven countries don’t meet standards for information sharing and screening to ensure visitors to the US don’t pose a threat: Chad, Iran, Libya, North Korea, Syria, Venezuela, and Yemen. The eighth, Somalia, “generally satisfies” the requirements, but restrictions were needed because of the “government’s inability to effectively and consistently cooperate” and the “significant” terror threat emanating from the country, according to the president’s proclamation. A ninth country – Iraq —was also deemed not to meet the “baseline” standards for vetting but the ally country won’t be subject to the ban because of its unique counterterrorism and diplomatic relationship with the US. Countries will be removed from the travel ban when they meet the standards for information sharing on identifying their nationals. “Countries may come off the list as we review them,” another Administration official said. 2. a) Why did the president issue a new travel ban? b) What steps did the administration take to determine which countries should be on on the list? (And what requirements did countries have to meet to avoid being on the travel ban list?) Be specific. 3. a) List the countries included on the original order that expired Sunday night. b) Which country was dropped from the list? c) Which countries were added to the list? d) When will the new travel restrictions take effect? 4. a) Define vet, waiver and exemption. 5. What is the status of Iraq regarding the travel ban? 6. How/when would a country be removed from the list? a) Are the reasons for the travel ban legitimate? Explain your answer. b) Is the travel ban tough enough to be effective? Explain your answer. Administration officials say the decision to restrict travel to the countries named in the order was the product of a deliberative and collaborative process involving U.S. security officials and foreign governments. All countries were informed of baseline security expectations by the administration in July. While the original travel ban was in place, an interagency task force identified some 15 countries who fail to comply with U.S. security requirements. After consultation with the relevant foreign governments, that list was reduced to eight states, several of whom were described as intentionally noncompliant. Document security refers to ensuring the integrity of visas and passports, fighting credential fraud, and sharing information about lost or stolen travel documents with U.S. and international law enforcement entities. Specific details as to the deficiencies of each country will not be made public given diplomatic and security sensitivities. A State Department official said detailed instructions to maintain and ensure compliance with U.S. expectations have been wired to all American embassies. NOTE: The proclamation sets no guidance with respect to refugee resettlement. Though refugee entry is suspended under the president’s initial order, the ban will expire later this year. Officials say new guidelines for refugee entry, including a figure on the total number of refugees the U.S. will accept for the coming fiscal year, will be released in a matter of days. Read the text of the new travel ban at whitehouse.gov.